Cassidy: I have two questions! For the first, I’ve been doing a lot of research lately on early 19th century women’s dress, and it’s struck me that for the most part during the 1800s and 1810s, the dress itself is so much less important to being fashionable than the accessories, and a white dress was frequently chosen for everyday and relatively formal wear as a backdrop for colorful spencers and ribbons. I’ve also seen quite a few fairly plain white cotton gowns with wedding provenances. Do you think that white gowns might have been chosen not just to show off status, but also to be readily integrated into the wardrobe afterward? For the second, I was wondering how you can tell that attitudes regarding the meaning of white changed with Victoria’s wedding. That sort of thing is so interesting to me! Susanna: Hi Cassidy, glad to hear you find it so interesting as obviously we do too! I think that you’re right. In the late eighteenth century certainly descriptions of what an aristocratic wife wore for her wedding often spend as much time describing her jewellery as her dress, so they were vying for importance. 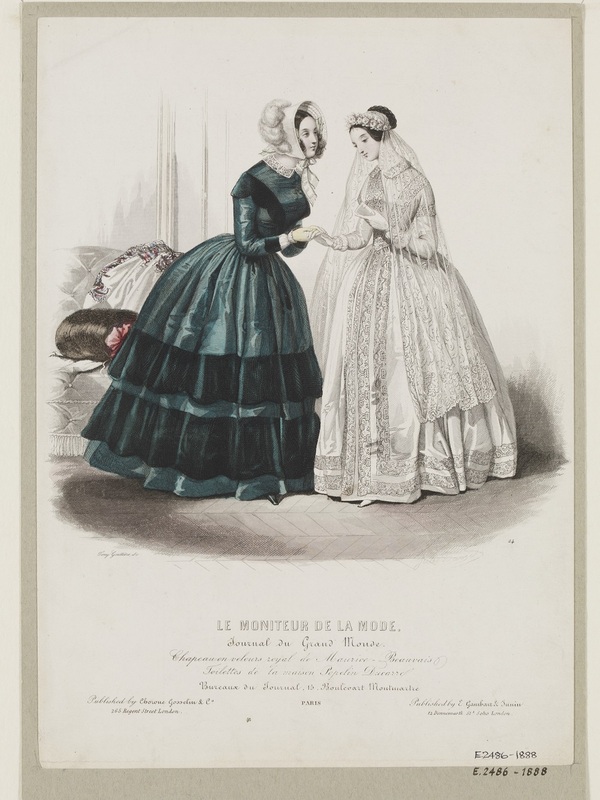 White gowns certainly leant themselves easily to a future position in a wife’s wardrobe, as they could be dyed a more practical colour or, as you have suggested, kept in their original colour and accessorised. Equally, muslin and white fabric were hugely fashionable in the period you mention, and so their wear was not exclusive to wedding dresses. As any bride of that period, regardless of her wealth, should and would rewear her wedding dress, a smart one would have it made in a grand but adaptable style, in order for it to have stylish longevity beyond the big day. 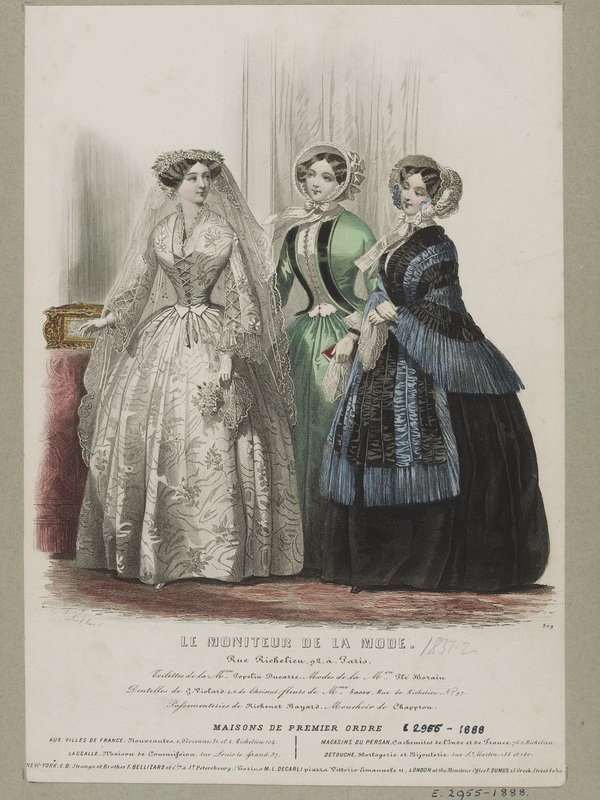 With regards to your second question, allow me to explain a little further how we can tell that the association between bridal white and purity was cemented in British fashion after Queen Victoria’s wedding. The modest bride in her white wedding dress features regularly in the literature – for instance, the work of Charles Dickens – and art of the Victorian period. Equally, at this point, print media and newspapers really begin to take off, and descriptions of Society weddings, and the appropriateness of either the match or the clothing, would often make their way onto such pages. With print media also came commercialisation, and fashion plates and adverts sold the public the image of the white dress, lace veil and orange blossom sprig ideal that still lingers today. Queen Victoria stated that on her wedding day she would make her vows as Albert’s future wife, not as the monarch. In reflection of this, she chose to wear a white satin court train, bordered with orange blossom, instead of the crimson velvet robe of state. This romantic gesture, demonstrated in her choice of clothing, and the image of Queen Victoria as an adoring and innocent bride, really captured the public’s imagination, and cemented the connotations for good. This image and ideal spread quickly. Their wedding was the subject of many paintings, such as ‘The Marriage of Queen Victoria and Prince Albert, 10 February 1840’ by George Hayter, 1840-42. Newspaper reports, affordable prints and souvenirs ensured that all levels of society were exposed to this model of romantic propriety. 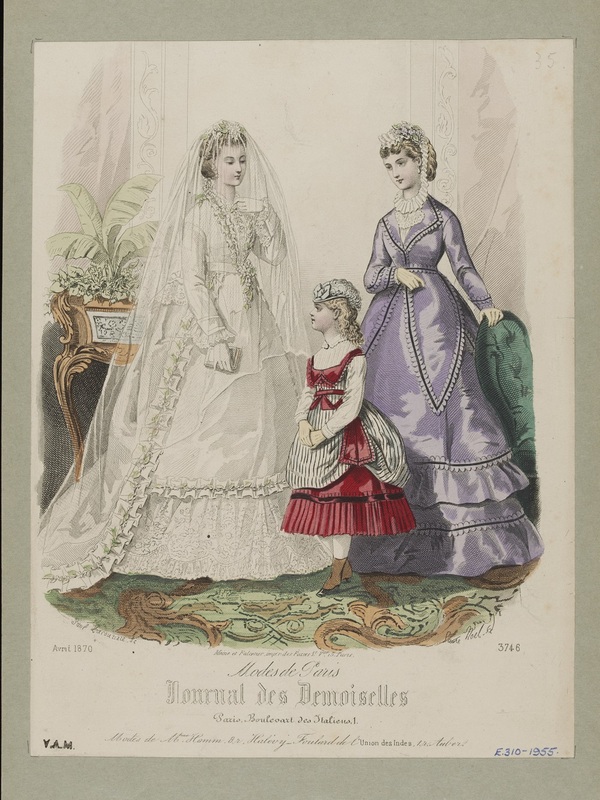 While coloured wedding dresses were still common, the majority of the illustrations of blushing brides on fashion plates, Valentines cards and sheet music from then on were depicted wearing white. As a result, if a bride was marrying for the first time, and could afford it, a white wedding dress became the norm. Susanna: Hello Daniel. Thank you for bringing this up. We were aware of this. Our personal specialist areas, and the content of the exhibition, focus on fashion from the eighteenth century onwards. However, the exhibition’s curator Edwina did research this matter. In Ann Monsarrat’s And the Bride Wore…The Story of the White Wedding (London 1973), citing Archaeologia, vol. 47, she states that the princess was wearing ‘a tunic and mantle with long train of white satin worked with velvet, furred with pured miniver and purfled with ermine; and the sleeves of the tunic also furred with ermine’. The implication is, therefore, that the train of the dress was white, not the entire bridal attire. Other royal brides before Victoria will have included white elements in their wedding wear, but she is, to our knowledge and research, the first in British history to dress in it entirely. If, however, the source you referred to does state and translate from its primary Latin sources that the sleeves and, particularly, the tunic were also white, please do share it with us, as we and other scholars will be grateful for the clarification. Equally, however, the exhibition, and so our blog, focuses on the developments of the white wedding dress in Britain. While Philippa was from England, she married Eric of Pomerania at the Lund Cathedral in Scania, Sweden. It was of long standing and on going tradition that a royal bride from a foreign country had to, upon entering the country in which she would marry and probably make her marital home, dispose of her clothes from her homeland. These clothes would be replaced by a trousseau and wedding wear prepared for the bride in the country she was entering. Therefore, if Philippa did marry in all white at this time, that decision will have been made by officials or family from her new husband’s home as a reflection of the culture, fashion and traditions she was entering, and not of those she had to leave behind from her upbringing in Britain. did you do history for your degree or a fashion degree, I am very interested how someone gets into this type of work thanks. Hi Susa, Thanks for your comment. I studied English Literature and History of Art, and then did an MA in History of Art and Museum Curating, on which I specialised in Fashion History. People come into museum work through lots of different routes. It’s also about gaining experience and specialist interests. For instance, I also worked in vintage clothes shops and put on stalls at vintage fairs while I was a student to get some experience handling objects and to channel my fashion history interests. Hope that helps. do we know who made queen Victorias wedding dress? Is there a particular reason why most British royal brides wear long sleeves? Is this a tradition or a royal protocol? Because I hardly see any of them wearing a modern heartshaped wedding gown without sleeves. This is a great article. Very informative. Thanks for sharing. The wedding gown has a rich history, in color, material, and styles. Most brides want to wear a traditional dress, not realizing how it has changed over time. Very few people know the history of the wedding dress. This was a very interesting read. Thanks for sharing. I absolutely agreed with the comments of Mary Wine. It’s true only few people knew the history of the wedding dress and this is the site where people come to know the history of wedding dress. Thanks a lot for posting such an information. I am really happy to glad find this article.I found wedding dress shopping quit easy because ,I am a fairly decisive person who knows what that want unfortunately because of my budget.I am glad bought my sample Lazaro dress and thought it was a amazing on me and fitted my style perfectly but wish i had the perfect experience to match.Thanks for sharing this amazing dress. I absolutely agreed with the comments of Mary Wine. It’s true only few people knew the history of the wedding dress and this is the site where people come to know the history of wedding dress. Thanks a lot for posting such an information.Thanks for sharing this post. Wow! what a wonderful dress. I am always keen to wear long dress.Recently i got a dress which is totally seem look like that. These fancy and wedding style dresses feels me glad. These gorgeous gown adorn the groom beauty. I appreciate these types of dresses. Thanks for sharing.